Ted Cruz birthers aren’t going away. And their speculation is being fueled by mainstream GOP elites. 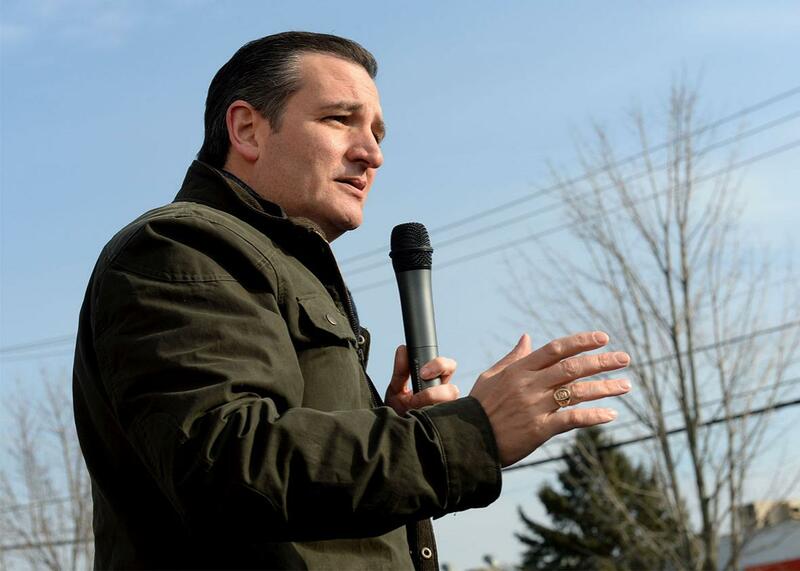 Sen. Ted Cruz speaks at a rally on Jan. 12, 2016, in Hudson, New Hampshire. What do Donald Trump, Sen. Mitch McConnell, Iowa Gov. Terry Branstad, Republican National Committee Chairman Reince Priebus, Ann Coulter, bomb-throwing Democratic Rep. Alan Grayson, Sen. Ted Cruz’s former Harvard law professor Laurence Tribe, a smattering of other constitutional law professors, your super liberal mother-in-law, and really anyone else who enjoys a good time all have in common? None of them will forthrightly declare that Canadian-born Sen. Ted Cruz is eligible to serve as president. After Trump renewed speculation that Cruz is constitutionally ineligible to serve as president, others refused to rule out the possibility too. Some of these Cruz birthers, like the outlying constitutional law professor who wrote this Washington Post opinion piece, believe that the consensus understanding of the Constitution’s “natural born citizen” clause—that it is meant to include U.S. citizens who are born as such, even if born abroad—is incorrect. But others may (may!) be fueling the skepticism because they consider it fun and/or politically savvy to troll Cruz. To wit, an unseemly number of leading Republicans are claiming they don’t want to get “involved” in the question of whether Cruz, who has a better chance than most of becoming the Republican presidential nominee, would be constitutionally able to serve as president. A topic in the news today: Ted Cruz was born in Canada. Is he constitutionally eligible to be President? Listen, I don’t get involved. I’m not going to get in the middle of all these candidate issues. It’s a bad place for me to be. I’ll let all these folks argue about this stuff, and I’m going to stay out of it. Perhaps Priebus calculated that dismissing Cruz’s eligibility issues would come across as slamming Trump for frivolity, and, again, he’s been working overtime to pretend that he considers a Trump nomination acceptable. If so, that’s an incredible moment of overthinking, because here we have a reporter asking him if one of his party’s chief presidential contenders is eligible to be president and he is declining to offer comment. There haven’t been many surveys measuring public opinion about Cruz’s eligibility since Trump entered the discussion into the mainstream last week. But one that came out on Tuesday, from the Huffington Post and YouGov, shows that Cruz is in decent shape to weather the attacks for now. The survey is good for a laugh: 53 percent of Republicans aren’t sure whether President Obama, who was born in the United States, is an American citizen, while 70 percent “don’t have any doubt” that Ted Cruz, who was born in Canada, is a citizen and eligible to serve as president. We’ll see if those numbers stick or if this becomes a bigger problem for Cruz as the conversation continues. “The call asked whether the respondent had heard about Trump’s accusations that Cruz is not a natural-born citizen, and whether they believe Cruz is eligible to run for president,” RealClearPolitics writes. “The call also asked the listener whether Trump’s charge against Cruz would affect their vote.” RealClearPolitics ascribes the call to the “Cruz camp” and “Cruz allies,” though the piece doesn’t seem to prove that. Some group, though, that is trying to take down Trump in Iowa must believe there’s meat on this bone. Maybe it will drag Cruz down in Iowa; maybe it won’t. But this story isn’t going away for Cruz as long as influential party figures are refusing to comment on his eligibility for president of the United States—and, in effect, increasing uncertainty on the subject. Read more of Slate’s coverage of the Republican primary.